Hey! Sorry I missed last week! I actually have a backlog of subjects for posts, but last Friday I got hit with two pretty big, time consuming projects. I’ll share one of them later this week, but I’ll sit on the other one for a bit [though you might have already seen it if you follow one of the other websites I blog on]. Anyhow, this week is the New York Comic Con. I am not able to make it, but First Second asked me to design a poster promoting Americus for the convention. Like the emblematic image they had me do, it was sort of left up for me to come up with something. MK had suggested that I do the image that is hanging in the library advertising Book VII of the Apathea series. Being under a somewhat tight deadline, and not having time to brainstorm something else, I thought I’d go with that. Here’s the image I came up with. The most critiques were having so much brown in it, which I could totally understand. In my head I was trying to go with an old 70’s fantasy poster, but all that brown is a little boring. Calista, the head-honcho editor on Americus, had some other problems with the image – she didn’t think that the image represented the theme of defending books as well as the emblematic image I done the previous week, that Apathea’s cloak took up too much space, and that the angle of Apathea’s head was confusing. 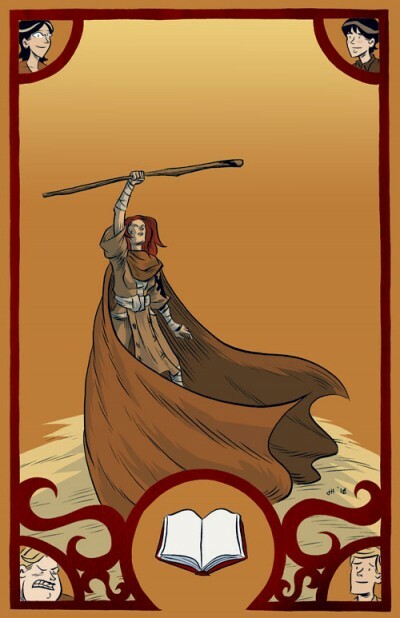 All of us discussed it a bit, and in the end, we decided to recycle the emblematic image in the design element of the frame that I came up with for the original poster. 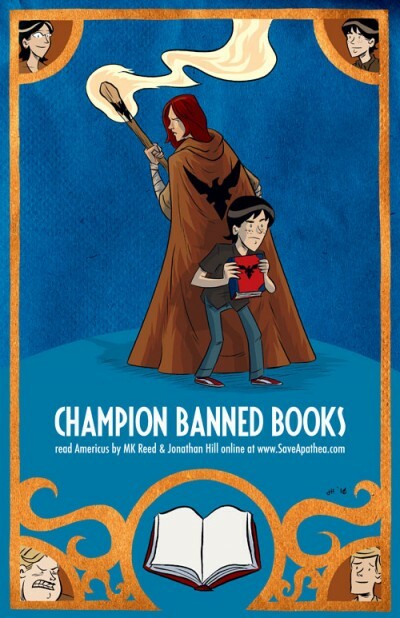 When it was all said and done, this was the image that was decided on to be printed as posters for the NYCC. It’s usually pretty hard for me to get projects over the weekend because I work at Powell’s Saturday & Sunday – last week was particularly hard because as I mentioned before I had two projects due on Monday. 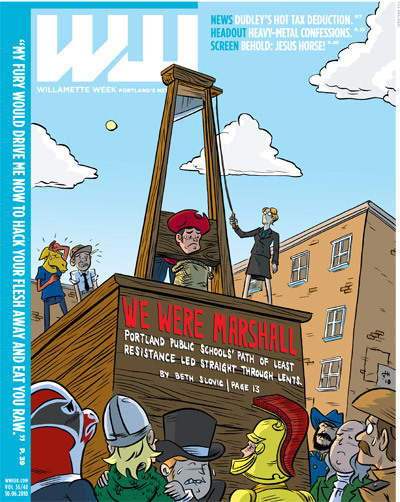 One of those projects was the cover for this week’s Willamette Week. 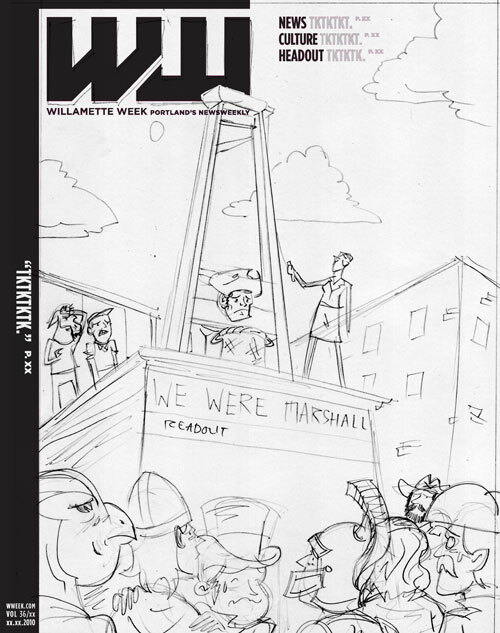 Unlike the last time I did a cover, this went a lot smoother. The story involves the closing of one of the public high schools in Portland as part of the restructuring/redesign for next school year. You can read the article here. Since I had to juggle this with another project, my approach to the work was pretty straightforward to try to cut down on communication & time. 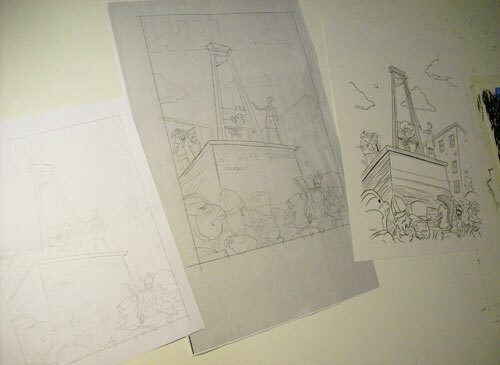 I did a tight sketch/thumbnail for the art director to look over and see if there were any changes needed to get made. 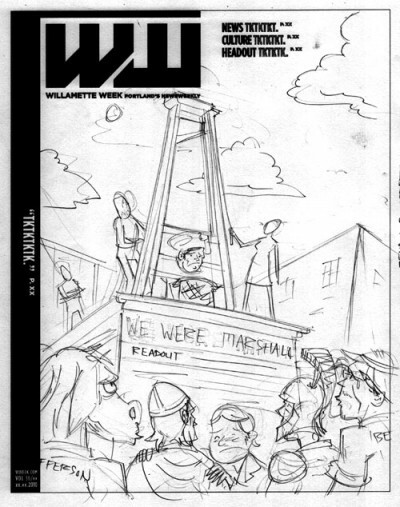 Because he wanted the guillotine to cover part of the header, I went ahead and drew the illustration directly on a printout of the layout of the cover to make sure I got the proportions right. That’s all for this week. Americus is due next Friday! Wish me luck! I like the poster a lot! I think the color change was a good one. Gold in the border is nice. Did you base the new image on the Papercutter cover? Thanks, Greg! Sorry it took so long to reply to this. Yeah, the concept of the emblematic image [and even the color scheme] were inspired by the Papercutter cover. I thought the image was a really great image that showed the two worlds of Neil and Apathea fighting for something. Really though, I just like to keep it green and recycle all the time – even ideas.